Ironing 101 Tips. 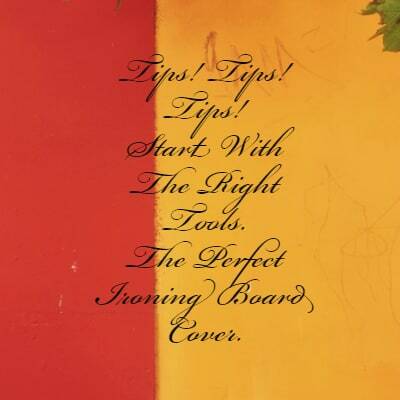 Ironing Board Cover Tips. What Makes A Cover Perfect? Ironing 101 Tips. What Makes An Ironing Board Cover Perfect? Ironing Board Cover Facts. Facts. Facts. I’ve spent 24 years talking to men and women about ironing board covers. And your demands are very simple. Cover the top of your board. Lengthwise. And widthwise. And have a generous margin of fabric sitting underneath your board. There should be no skimping under the board. It should always be smooth. Wrinkle free. Crease free. It should never move on your board. Or slip. Slide. Ride up. The fabric should be a sturdy cotton. Polyester won’t do. It’s not heat resistant enough to last for several years. The cotton weave should be tight. The closer the weave, the more durable the fabric. Preferably a diagonal weave, like drill. Which is hard to tear. The colour should be colourfast to trimfast stage. Meaning. You can put a wet white shirt on the cover. And the colour won’t bleed onto the shirt. Reds are a very hard colour to stablise. So be wary of any cotton cover with red in it. It has to be machine washable. In any cycle. At any spin speed. At any water temperature. If the fabric is strong and sturdy, it won’t disintegrate in the washing machine. A professional ironer will wash their cover every day. And last of all. It should look glamourous on your ironing board. It should be a cover you’re proud to have your guests iron on. Ironing 101 Tips. What Ironing Board Cover Do I Recommend? As I’m the designer. Maker. And purveyor of. The Fitz Like A Glove™ Ironing Board Cover. This cover is the ‘It Cover’ of ironing board covers. Or as the Marketing Manager of Hills Industries described it when he first saw this cover in 1994. It’s the Rolls Royce of ironing board covers. If I recommend my own products, it’s because I truly believe they are the best. I wouldn’t put them out there if they were less than superior to everything else available. But. Perhaps you hanker for a padded cover. That’s reversible. There are two online sites that may appeal to you. I would recommend Suzy Hope Designs. And Sewroo. Both companies make their ironing board cover in Australia. I do not recommend Spotlight. Target. KMart. Bunnings. Big W.
Ironing 101 Tips. How Do I Source My Tips? I have 24 years experience talking to tens of thousands of people who iron. All recommendations are my own. From my own research. And customer feedback. I receive no compensation from any company for recommending their products. Because. I only recommend best quality. You do get what you pay for. I write these tips to help you. If you like this tip, how else can I help you? Better yet. What else do you want/need to know about ironing? What tips would you like me to share with everyone? PS. Did you find this post helpful? I would love it if you would share it with your friends. Co-workers. Family. This Is Where I Live And Work. Every morning at sunrise, I go for a walk on my remote rural property. With my camera in tow. I photograph what I see. I have hundreds of thousands of photos to share with you. This is just a handful. You can also follow me on Instagram. Bucolic Bliss. 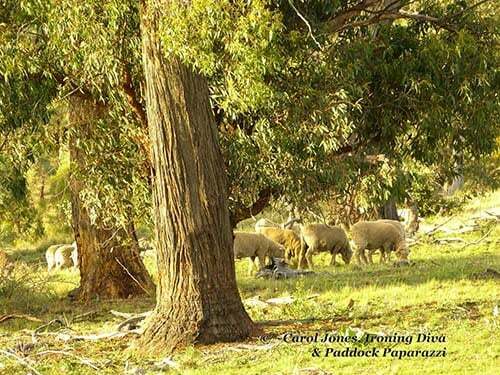 Sheep Grazing On My Rural Property. 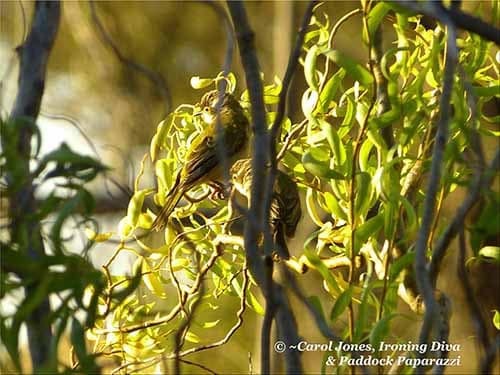 Brown Headed Honeyeater. Fledgings. In A Tortured Willow After A Splash In The Garden Dam. 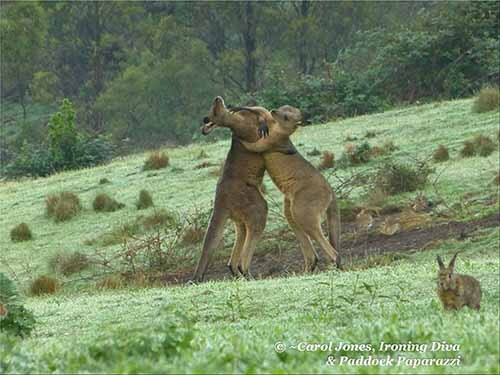 A Kangaroo Boxing Match At Foggy Bottom. 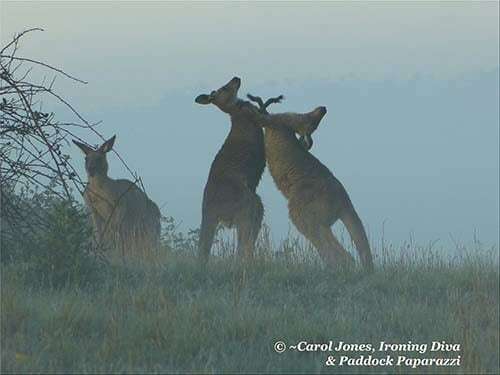 Boxing Kangaroos. 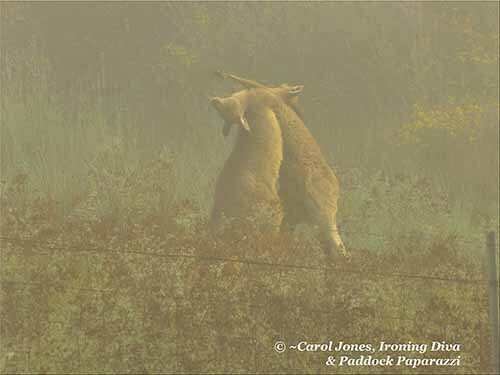 Ringside Seats For Peter Rabbit & Co.
Kangaroos Boxing At First Light On A Misty Morning. Made with love and care in rural Australia by men and women who have a disability.